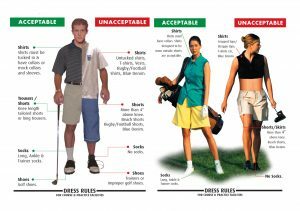 The following items are not allowed to be worn on the golf course: tracksuits, shirts without collars or sleeves, beachwear, replica football shirts and untailored trousers. Golf shoes must be worn by anyone going out on the course. Clean, smart denim jeans and trainers may be worn in the clubhouse.